that it was the best wedding they've been to." Thank you for helping make our special day perfect!" The Crystal Ballroom in Laguna Hills is one of Orange County's most popular wedding venues. 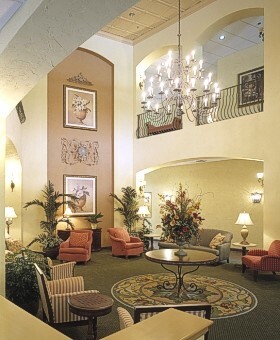 Quality cuisine and elegant surroundings await you at this convenient location in the heart of South County. The spacious Crystal Ballroom features beautiful crystal chandeliers, a large dance floor and an outdoor reception area as your guests arrive. We make planning easy by including complete set up, linens, centerpieces, head table, cake cutting, guest book table, tax and gratuities. "It was a wonderful experience. We would recommend you for any function." There is a food and beverage minimum of $8,000 for Crystal Ballroom for Saturday evening receptions, and a food and beverage minimum of $4,000 for Friday and Sunday receptions. There is a food and beverage minimum of $4,000 for Justine’s for Saturday evening receptions, and a food and beverage minimum of $2,000 for Friday and Sunday receptions. 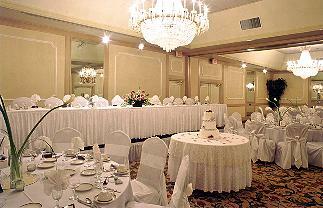 We make your wedding sparkle in our Crystal Ballroom. Say "I do" to a wedding designed to make your dreams come true at the Crystal Ballroom in Laguna Hills. Weddings are our specialty and we provide a setting of beauty and impeccable service along with so much more. 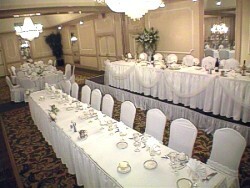 Our banquet rooms are beautifully appointed with crystal chandeliers and we can accommodate 50 to 300 guests.